"Pull hard and she comes easy." Fisher Poets is here! Today and tomorrow, Feb 25 &26 is the 14th annual Fisher Poets Gathering in beautiful, sunny, downtown Astoria Oregon. And so am I. This is my first year at the FPG and I'm a greenhorn. But, no worries. I didn't even have my bags out of my rental car at the hotel yet when I ran into someone I know, Steve, a fellow gillnetter in Cordova. He's an old salt at reciting his poems here and is showing me the ropes. Last night, we checked out the Voodoo Room, one of the 8 venues where the performances are held this year, http://www.columbianvoodoo.com/. I'll be there tomorrow night at 7 PM. Then, it was over to Clemente's for a dinner, meet and greet and open mike. Appetizers included Carpaccio, a thinly pounded local Albacore tuna with olive oil, shallots, black pepper and a touch of lemon and garlic, served on warm bread. For dinner, I had the Oysters Casino. Fresh Willipa Oysters broiled with bacon, chives, bread crumbs, Parmigiano Reggiano cheese, and a cream sauce. Yum. FPG is part of an Astoria tradition, bringing men and women tied to the commercial fishing industy together to share stories, poems, memoirs, essays in celebration of the industry and it's people. It's people, the community of fishermen. Birds of a feather flock together. That's it. That's one of the things that has kept me fishing all these years. I started fishing for the adventure of it, some 18 years ago, but the reason I keep coming back to it is the people. 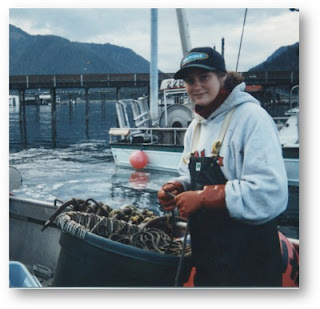 At last night's dinner, there were folks there I knew from fishing in Cordova, AK. Like Buck, Lloyd, Phil, Dennis and Patty. Then there was Rich and his wife, Marsha, whom I met in Hawaii a few years back. And there's Pat and Jon, who I'd emailed when arranging to come to this and finally met last night, face to face. Then there's guys like Dave, who I sat next to last night. Turns out, he and I both worked for the same family but at different times. He worked for Gene Sheldon back in the '70's when kids two boys, Brian and Dave were still kids. In the mid 90's I worked for Dave. Small world. But that's what I love about it, you just start talking and before you know it, there's a connection. As I mentioned in last week's blog, the performanced will be live on the radio. Community radio station KMUN-FM broadcasts the Friday and Saturday evening program from the Astoria Event Center. This includes "streaming live" over the web at http://www.coastradio.org/. Simply go to their website and on the left click the button "Listen now on Demand". I'll be on between 7 and 8 PM Pacific Time Friday night! I'll be doing a shorten version of a story from my book, which will, hopefully, be out later this year. I can give you a sneak peek of a poem that I'll be reading, too. Just don't tell anyone. I wrote this poem a few years ago, before I fell of the wagon on quiting fishing. It's call Fishin' Again. I don't remember all the poems done last night, but I"ll share what I can. Rob's was about riding a 5 gallon bucket: Those rodeo guys got nothin' on me, I"ve rode a 5 gallon bucket in 40 foot seas! And when the boat rocks port to starboard you get a bit drenched, just like those toilets, designed by the French. If you want to take a gander at other performers and what they are up to, there is an anthology of FPG songs, poems and stories called "In the Tote" put together by Pat Dixon, http://web.me.com/dixonphoto/Fisher_Poets_-_In_the_Tote/Welcome.html. Or, click here to check out last year's venue http://www.clatsopcc.edu/fisherpoets_archive/. A lot of the perfomers have Cd's and books out, these will be for sale during the weekend. 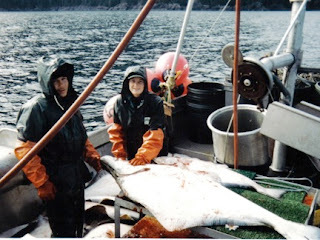 My buddy Steve, has some great poems on his CD titled Give a Dollar to the Sea: Poetry and Songs of Alaskan Fisherpoet Steve M Schoonmaker and can be reached at saulteur@hotmail.com. First off, I'm very excited to let you know that I'll be performing at the 14th Annual FisherPoets Gathering in Astoria Oregon next week, February 25th and 26th!! I'm on both Friday and Saturday night around 7:30 P.M. Pacific Mountain Times. My Friday night's performance will be broad casted on 91.9 FM KMUN @ www. coastradio.org. To give you an idea about this celebration, I've taken the following is taken from their website http://www.clatsopcc.edu/community/fisherpoets-gathering. I'll have more on this next week but in the mean time, check it out! The schedule and all that is on their website. 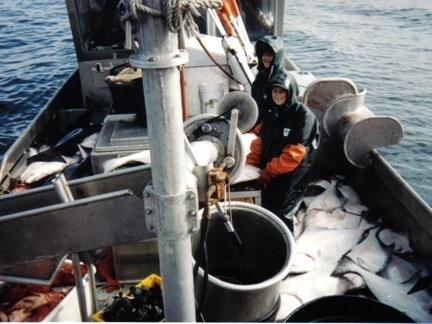 The FisherPoets Gathering (FPG) is expecting a record number of more than 80 fishing and maritime industry people from several states and British Columbia to bring their original poems, stories and songs to Astoria. Along with several local musicians who also have strong fishing-industry ties, they will present their readings and music at this 14th annual weekend program, February 25 to 27. "Fisher Poetry" comes from experiences living and working in the industry, and ranges in writing style from fast-moving rhyming couplets to crafted free verse or literary prose, and includes poems, songs, short stories, personal memoirs and essays, along with art. KMUN-FM community radio broadcasts both evenings live 6 to 10 p.m. from Astoria Event Center at 91.9-FM & www.coastradio.org. Enjoy! So, its looking more like the Egg is closer to 50 than 30 years old! Wow. It'll be eligible for social security soon. 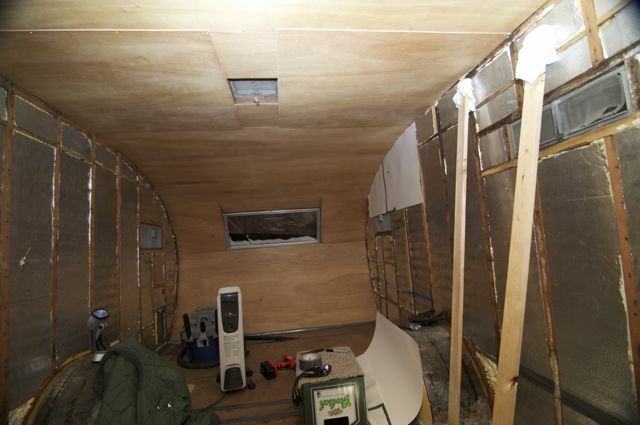 But, I got to tell you, the wooden ribs on the inside of the camper are beautiful! No knots anywhere and for the most part, with the exception of a few portions of the ribs, they are still all good and solid. The plywood floor is in a little better shape and again, no knots at all, a sign of older wood. 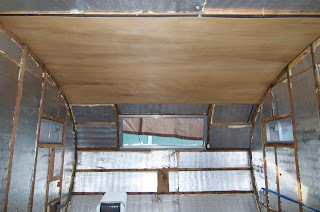 This week's progress was hanging some of the panels up. 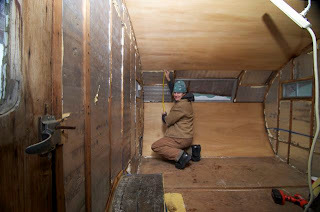 We thought we would just fly through it and be on to installing the bunk by now, but we are still hanging panels. That's OK though, we are taking out time and it shows. I think it looks pretty good. One of the reason its slow going, the main reason, is that the Egg is not symmetrical. Guess after 50 some odd years of shimmying down the road, I'd be a little off kilter, too. We've had to accommodate for that. 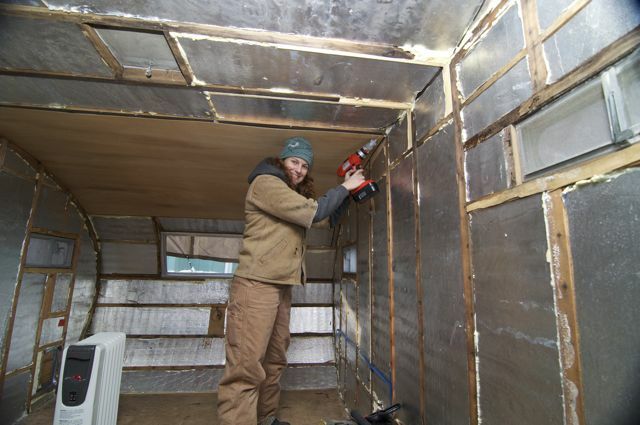 A panel might be 1/8-1/4 inch off from one end to another. Or ribs will not be aligned and things like that. Anyway, we are getting there. 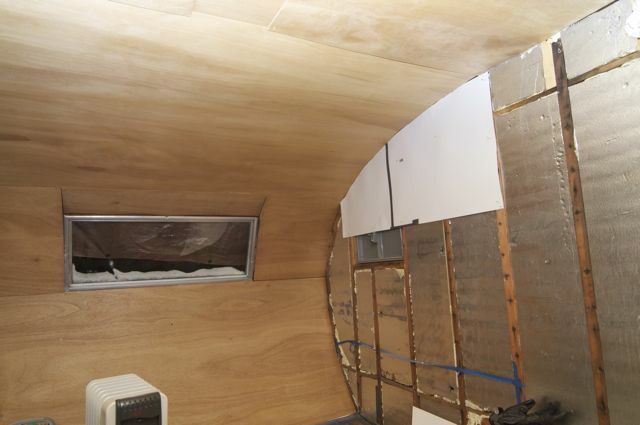 We got the two ends covered and the ceiling up. 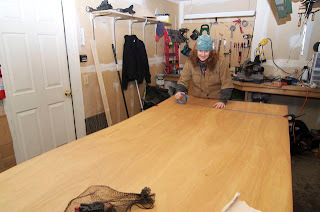 See our progress below from measuring out the panels in the garage to hanging them. Currently, Vince is making forms for the walls. 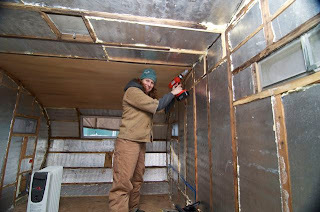 First, he made them out of poster board to copy the curve of the back wall. Then he transfered the poster board and copied it onto a left over piece of insulation. After that is fitted correctly, then he will copy that onto the paneling, cut and install. Easy peasy. Tune in next week to see if we are pulling our hair out by then, I mean to see our progress. And, I'll see you in Astoria! Anyone remember that at the end of some Ozzy Osborne song? Well, it's become a reality for me. I call it "Project Egg". 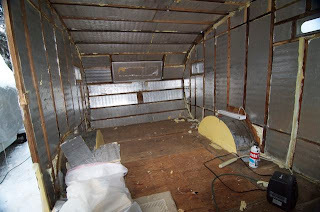 I recently purchased (gotta love Craigslist, best thing since sliced bread, if you ask me) a 1971 12'x7' camper. However, I'm doubting this thing was built even that recently. Maybe mid 60's? Anywho, the plan is to remodel it, throw some creature comforts and necessities in there, drag it over to Cordova and call it home sweet home for the fishing season. Chris, the gal I bought it from had gutted it, insulated the s*!t out of it, made a few rudimentary necessities, threw a in a heater and lived in it in her friend's driveway in East Anchorage all winter. 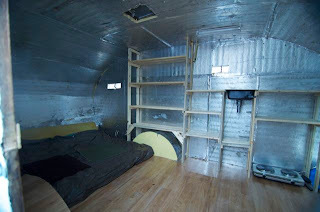 One fact I like to point out whenever someone tells me I'm crazy for planning to live in this thing for the next 5 months is that she lived in it in the winter! If someone calls me crazy first thing I do is point out someone else slightly more crazy than I am. It helps take the heat off. 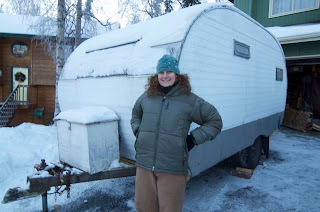 The second fact is that this camper in a foot wider, thus bigger, than the cargo trailer I lived in last summer in Cordova. And, unlike that trailer, this one has insulation. Thereby proving, that while I may be crazy, I am slightly less crazy than I was last year. You see, we all live and learn. This is what it looked like when I first got it. 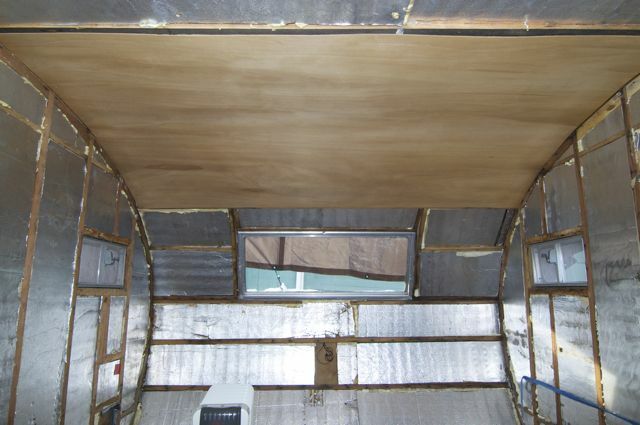 My idea is to re-do some of the insulation and tack up some sort of covering over it. If I don't I fear eating the insulation will become Hunter the cat's favorite past time. I decided to go with 1/8" mahogany plywood. It's not too heavy, expensive and is somewhat flexible. Next, we designed a bunk, dinette, closet, and sorta designed a kitchen space. That part is still a work in progress. Well, ok, the whole thing is a work in progress. First thing we (I roped my guy, Vince, into helping) did was rip out the second layer of insulation. About half way through this project I realized this whole thing undertaking is indeed a bit more than I initially anticipated. But, I'm committed now and too stubborn to turn back. This is our progress. Next, we set about melting the glaciers in the corners. At first, we made very little headway with the electric heater we had in there. 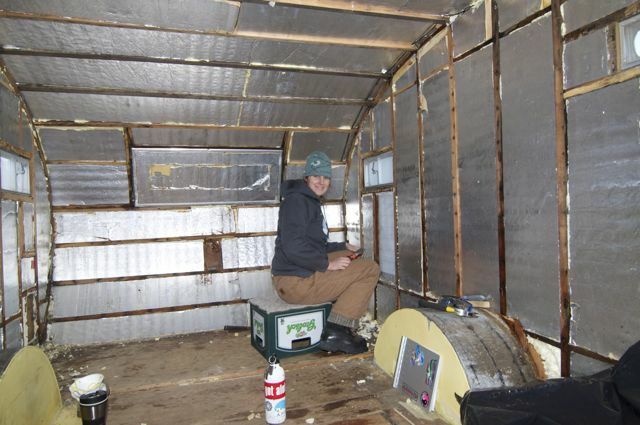 Turns out, its hard to warm up a trailer when its 10 degree out. We needed bigger guns. How about a heat gun? Me tackling glaciers in the corners. That worked well, but the novelty of that wore off in about an hour. We turned to the Mr Buddy propane heater that came with the trailer. It worked great! 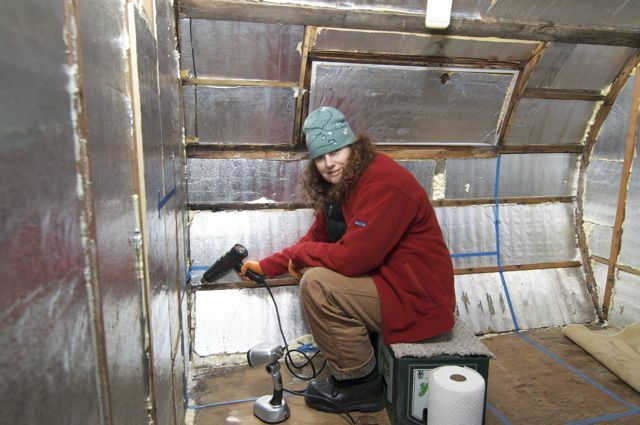 Who knew there was all that ice under the insulation? Until....wait a minute. Was the ceiling black before turned the heat to high? Probably not. Settling on medium heat and some fans, we went this that. Not quite as effective, but less likely to burn the Egg down. A few days later, I think we've finally made some headway, but not enough. 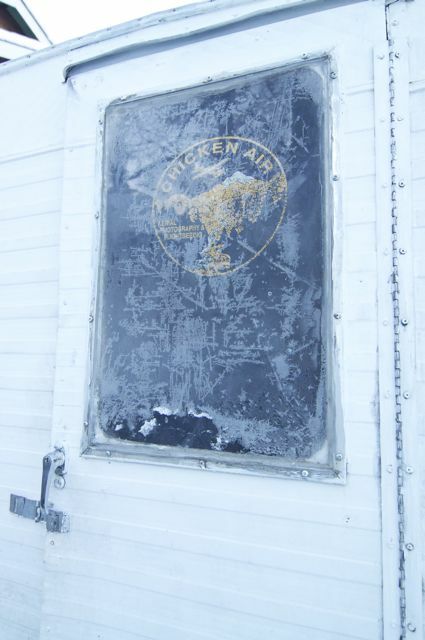 As luck would have it, the outside temps went from 10 degrees to about 35 and we were able to open all the windows and just let it air out. And, finally, it looks dry inside. Then I sprayed some mold and mildew killer, just in case. In the meantime, I'm varnishing the panels with Minwax Polycrylic and deciding on fasteners to use that aren't too hard on the eye. Aesthetics are everything! 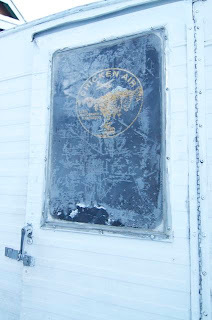 Such is the case with this Chicken Air tee-shirt screwed to the door as a curtain. 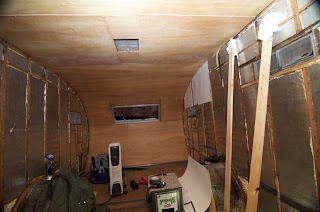 All the panels are now varnished and we will be hanging them this weekend and starting to build the bunk. Tune in next week to check out our progress.